A Glen Moray Elgin Classic, slowly matured in traditional oak casks. << The younger malty flavours of butterscotch and lemongrass are allowed to shine in this wonderfully light whisky >>. Colour: Light gold. Nose: At full strength, the aroma is fragrant and lightly drying with warming malty notes. The first impression is of butterscotch and shortbread with fresh herbal / grassy notes. Lemon curd and meringue are discovered in the background. Taste: The mouthfeel is lightly spiced with a warming and gently mouth watering effect. Malty toffee sweetness is present throughout with blackcurrants and a fragrant citrus lemongrass tang. Finish: Shortbread, fresh herbal notes (lemongrass) and the sweet spiciness of ginger marmalade. 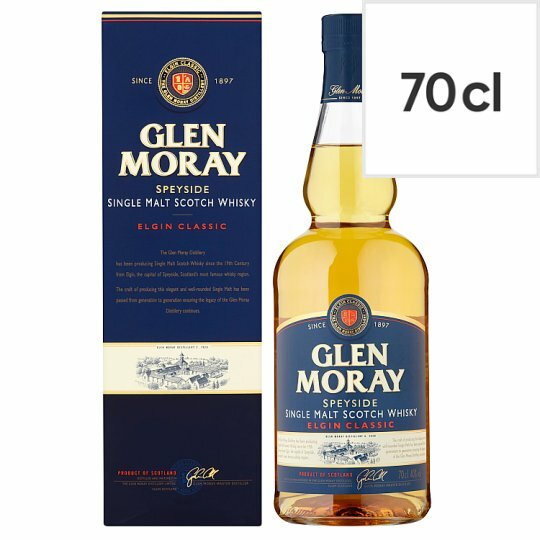 The Glen Moray Distillery has been producing Single Malt Scotch Whisky since the 19th Century from Elgin, the capital of Speyside, Scotland's most famous whisky region. The craft of producing this elegant and well-rounded Single Malt has been passed from generation to generation ensuring the legacy of the Glen Moray Distillery continues.